World Chess Champion Viswanathan Anand (India) defended his title against the challenger GM Magnus Carlsen (Norway) from 09-28 November, 2013, in Chennai, India. The World Chess Championship 2013 is a match that consists of 12 games (and maybe tie-break games). The first game is on the 9 th November, 2013. 2 hours for each player for the first 40 moves, after that 60 minutes for the next 20 moves and then 15 minutes for the rest of the game with an increment of 30 seconds per move starting after move 61 has been made. I will make all games replayable on this page as soon as I get them. And I will analyze all mistakes that lead to a loss of a game with the best chess programs available and will explain them here. In game 1 Carlsen had White and played a terrible boring setup, where he gave away the slight advantage that White players usually have. I don't understand why Carlsen does not play an active opening and tries to gain a slight edge with the white pieces that he might transform into a win later on. Anand just played a solid and comfortable set up and had no problems at all to get a draw. A very disappointing and boring game. I nearly fell asleep watching it. "First game of the match was a big disappointment. If White is obliged to play c5 and retreat the bishop to c1 then his all strategy had failed, then it is better to play 1 e4 sharper lines and to risk more but also to put Anand under pressure. I repeat, a big disappointment, such play you can see nowadays around most of open tournament ( Benasque, Pardubice, Sevilla etc ) at the lower boards..."
Anand (White) started 1.e4 to go for active play as he should. 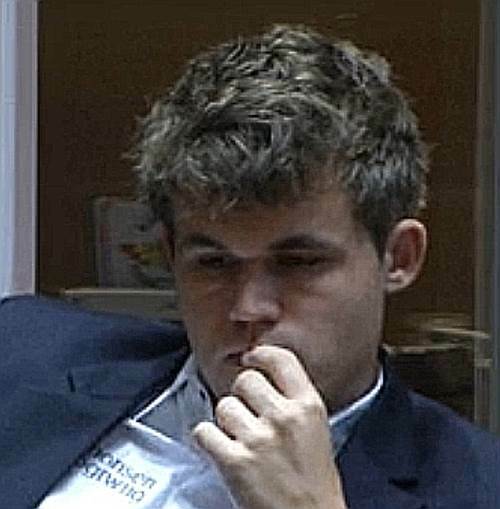 Carlsen defended with the Caro Cann defense. After trading queens at move 18 the game ended in a draw after 25 moves. "Very simple equalizer in game 2 for Black. 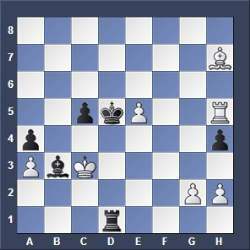 Why did not anyone before come to that simple idea to trade the knights on e5 and play Queen to d5 transposing to a drawn endgame? I am sure the club players like Mr Calvert of Elo around 2000 and others from UK would have found that idea for Black if they would play me! In chess a lots depends on psychology, one must not be afraid, and if weaker players are afraid of stronger Elo they will find at the end the way how to lose it, because as this match had proven, chess is a very boring and drawish game." 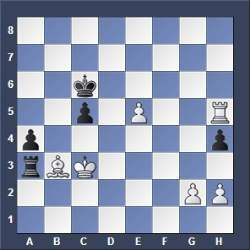 Carlsen (White) could not achieve an opening advantage. The game was fairly complex and required some fine decision-making. After Carlsen's move 28. e3?! Anand could gain a small advantage by playing 29...Bxb2 instead of 29...Bd4, but he missed it. After 28.e3?! dxe 29. 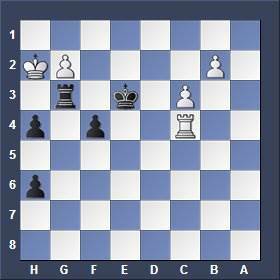 Rxe Black should capture the b-pawn 29...Bxb2 (instead of 29...Bd4) and would have a slight advantage. 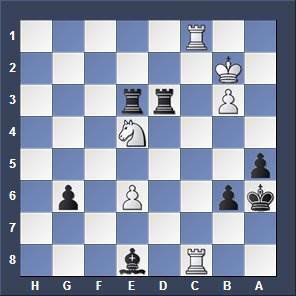 After some imprecise moves by Black the game quickly reached the endgame and was drawn. "Another draw in the match, some moves which are difficult to understand. Bishop to b4 and Queen to c1, this seems more like a friendly match than the world championship." "In the 3rd game of the match we saw the opposite coloured bishops. White had no weaknesses but Black had pair of bishops. This is no way for White to play for advantage in the opening. The manoeuvre of queen to h1 was strange ( in the style of Petrosian ). What is amazing that White played very strangely the whole game but he was only a tiny worse, not much worse. Like this play computers, not great, not logical, but not bad, always position is equal or even slightly worse but then computer waits for mistake. I got that impression when I played GM Cori in Benasque. 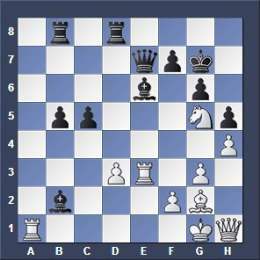 Anand could have played bishop to d4 instead of rook to d8 and later to put the rook on f8 in order to pressurize on f2. Obviously he was scared even to lose that game in which he was a pawn up." Carlsen (Black) defended with the Berliner Defense, traded queens early and gained an extra pawn, but this led to a passive position for him. Finally he reached a hard-fought rook endgame in which he had a slight advantage but could not transform the extra pawn into a win and the game was drawn. "44.R1c4!! 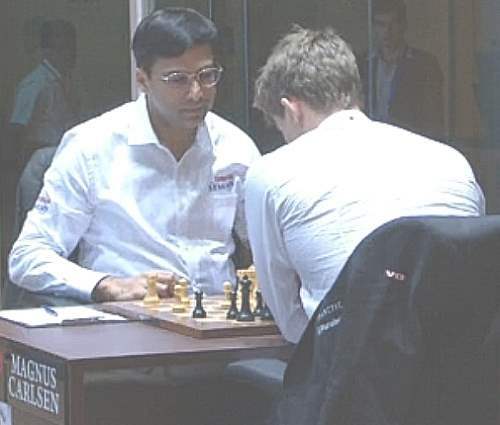 is the move which can be found only when your head is completely clear, but with so much being tired there is no way Anand will find this move which is extremely complicated." 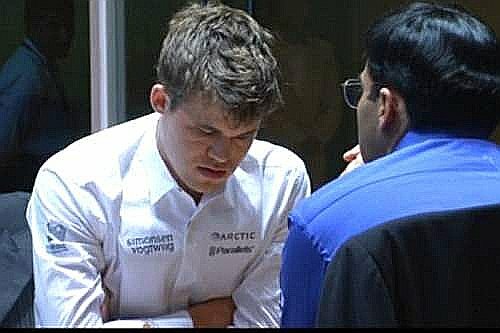 "As I predicted Anand is tired and he did not find that computer move ( he hasn't got a chip with him ), he only gave a check on a8 in order to put black's king away but now we have a 4-rooks-endgame which will be a torture for White because his b3-pawn is weak." "When Fischer played in 1970tees we had about 70% of decisive games when he played. Now in 2013, we have 0% of decisive games. Long live the computer chess technology!!!" Anand (Black) defended with a variation of the Slav Defense. The Queens were traded off early and in the resulting even endgame Anand made some slight errors and lost the rook ending. 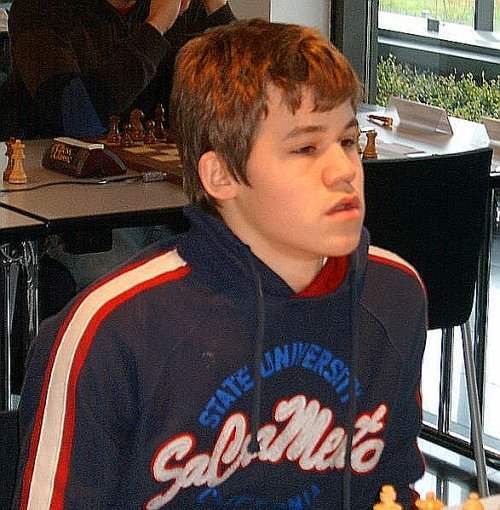 Magnus Carlsen (above) played precisely like a machine and won the rook endgame. Magnus Carlsen (Black) defended with the Berlin Defence which has the reputation of being very solid. He completely neutralized Anand's counter chances and entered a drawish rook endgame being a pawn up, but only had a very slight advantage. "I think Anand should have waited, why to give a pawn with 38 Qg3? I do not see how Black can improve after 38 Qf4." Anand played 60.Ra4? ?, the correct move was 60.b4. 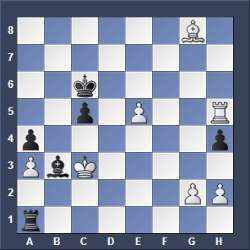 After this mistake Carlsen created a passed pawn on the f-file which finally would promote into a queen. Carlsen played the black pieces again and defended with the Berlin Defence (Nf6) as in the game before. The game was always balanced and ended in a draw. 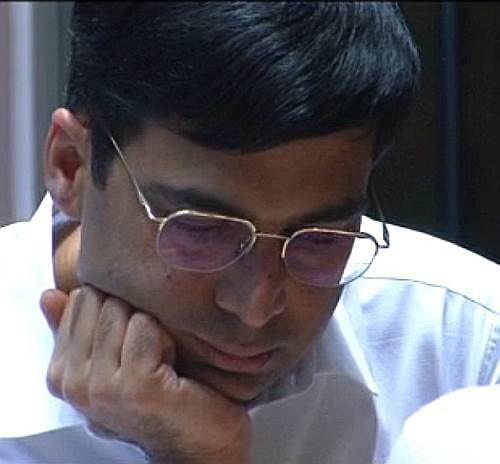 The game surely helped to stabilize the emotions of "Vishy" Anand who lost the last two games before.